BATTERY PARK CITY, December 12 -- As police stood off in front of Goldman Sachs with Occupy Wall Street protesters, ultimately making arrests, the crowd chanted "Crooks and thieves, protected by police." 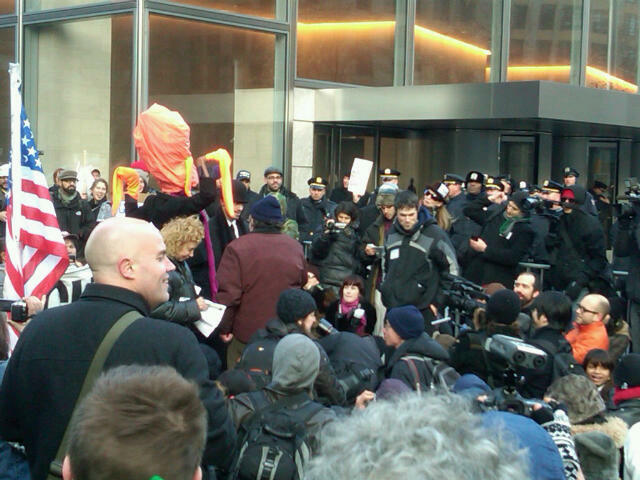 A mock press conference was held, in which faux reporters holding Fox News signs asked a woman dressed as a squid about Goldman Sachs' business. Video here, and embedded below. When a final question asked about billions of dollars in bonuses Goldman has paid its executive after receiving bail out funds, the squid refused to answer. The crowd chanted, "Calamari." Inner City Press was threatened with arrest by the police. Even before the financial meltdown in 2008, Bronx-based Fair Finance Watch had protested Goldman Sachs applications for regulatory approval, based on Goldmans' support for and securitization of predatory mortgage loans. When Goldman wanted a bail out, it was allowed by the Federal Reserve to form a bank on an emergency basis to receive the money, without any public comment. Inner City Press has asked senior Fed officials about this, only to be told they think that the time to review banks' Community Reinvestment Act record is not during mergers. But that's the only enforcement of the CRA. The protest was in solidarity with moves to shut the ports in Oakland and elsewhere on the West Coast. A flier distributed said that "port truckers organizing a union at SSA terminals in Los Angeles have been fired; SSA is responsible for inhumane working conditions and gross exploitation of port trucks and is owned by Goldman Sachs." After the squid press conference, protesters moved across the street to the Winter Garden atrium of the World Financial Center, run by Brookfield Properties which requested the eviction of the Occupy Wall Street encampment in Zuccotti Park, re-named Liberty Square. It's a small world in Lower Manhattan. Across the East River in Long Island City, Queens, Mayor Michael Bloomberg and Secretary Kathleen Sebelius of the Obama administration's DHHS appeared, in the name of jobs, with the CEO of American Express and Katherine Wydle of the Rockefeller-founded NYC Partnership, a defender of banks. That's a small world, too. And so it goes - watch this site.